This BBC clip from 1966 is absolutely fascinating if you like old buses, tube trains and airports. Features the West London Air Terminal at Gloucester Road. 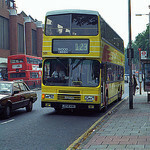 I can't play this, but I assume they didn't take a 37 to Hounslow Bus Station and change to an 81B there, bound for London Airport Central! Gloucester Road terminal was a fascinating place: unfortunately I never got to travel from there, but I did accompany my sister-in-law when she was off to Tenerife. 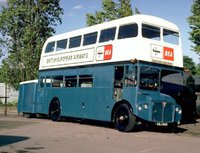 The BEA Routemasters, complete with baggage trailers, were the fastest of all RMs, and about half of them still exist.